It's orange season again! 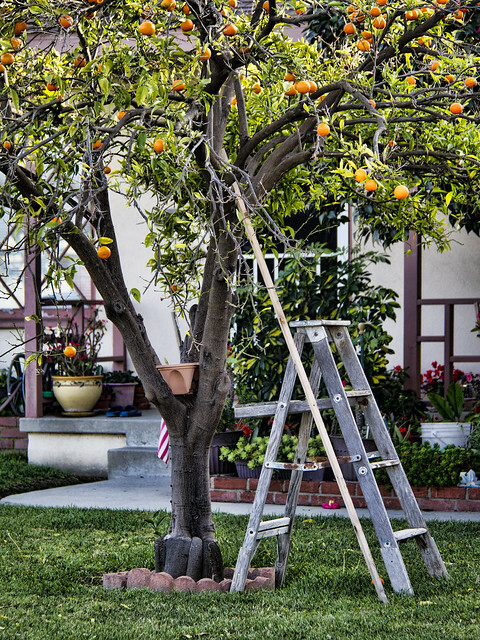 This picture contains three common sights these days: an orange tree covered with ripe oranges, a wood pole supporting a branch that is weighed down by too many ripe oranges, and the tools to pick ripe oranges. "Google is my best friend and my worst enemy. It's fabulous for research, but then it becomes addictive. I'll have a character eating an orange, and next thing I'm Googling types of oranges, I'm visiting chat rooms about oranges, I'm learning the history of the orange."